Easter round-up: a cracking exhibition, egg-cellent international trips and a team event that will be hard to beat! Now that we have time to reflect on a busy few months, we thought it’d be a good idea to let you know what we’ve been up to! 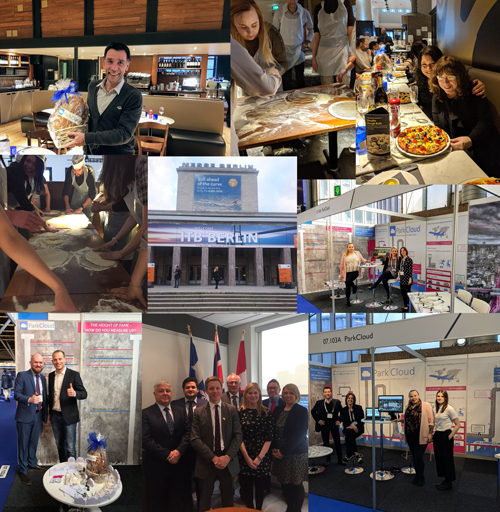 As always, the head office team has been busy looking after our clients and operators, as well as jetting off around the globe on different industry events! Elysia and Melanie headed to Germany to visit popular world travel show, ITB Berlin, as the rest of the team put together final preparations for one of our biggest annual events – Intertraffic Amsterdam. The leading trade event for traffic technology professionals, this year’s Intertraffic Amsterdam was hosted at the RAI and combined visitors and exhibitors from 140 countries worldwide. As exhibitors, ParkCloud were able to meet up with customers and clients – current and new – to discuss new developments and ongoing projects, as well as catch up with industry peers and enjoy a Heineken or two! While the Intertraffic team were busy in Amsterdam, our Relationship Manager Nicola went transatlantic and flew over to Canada to visit the British Consulate in Montreal with Greater Manchester Chamber of Commerce and other commercial representatives from the region, to discuss opportunities for international trade. Finally, after a busy few months, we came together on Thursday to host our latest team event. The order of the day was pizza making and the prize for the team member who reigned victorious was one of our popular, luxury chocolate eggs! After a two-team battle to create the best Calzone, and an epic toppings creation from Elvan, the chef decided the individual winner was Julio – who had expertly structured a symmetrical masterpiece! Grab a slice of the action in our picture round-up!